"Why is this four-legged ‘Head of Ranch Security’ making news in Fort Worth?" Texas author inducted into the literary hall of fame! 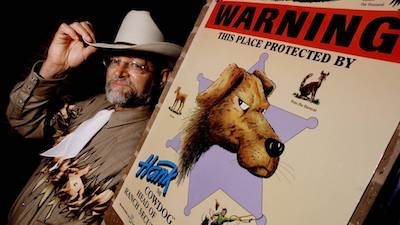 "Hank is the central character in the “Hank the Cowdog” book series by John R. Erickson of Perryton. Like the author, Hank lives on a ranch in Perryton — 377 miles from Fort Worth in the Texas Panhandle. Hank calls himself “Head of Ranch Security” and solves cases on his ranch.